Claims: Nourishing shine beyond compare... Experience the richest indulgence for your lips. .. and shines like a gloss! NutriShine by Colour Riche offers more glossy shine than a classical lipstick leaving lips looking luscious with a non-sticky finish. The formula contains fine crystal polymers that reflect light thanks to a very fine network of particles that create a texture as clear and shiny as jelly! L'Oreal NutriShine's Pink Rose is a vivid pink with pretty, fine shimmer and a non-sticky, glamorous finish. The color selection is nice but I am not sure about what the exact number of shades is, as everywhere I see the number of shades reported is different, but they have launched at least 10 shades in India for sure. If you are a fan of Revlon lip butters, I am pretty sure you will like these as there concept is somewhat the same: lip-balms + lipsticks. Though NutriShine Lipsticks definitely have some glossier/shinier alternatives. Now I am not that fond of Revlon lip butters, and NutriShine is not my favorite either, mainly because of the sheer pigmentation and low staying power. Pink Rose stays on my lips for an average of two hours, and that too without any disturbances. 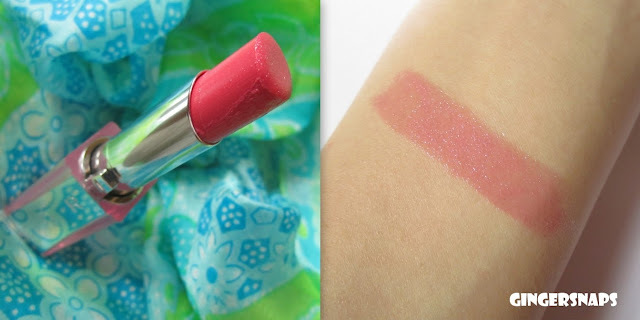 But this lipstick totally lives up to it's claim of being super moisturizing and because of it's hydrating formula, moisturizes dry lips quite well without settling into lines. Paisa Vasool: Yes. I have given this lipstick a 3 put of 5 only because I personally prefer lipsticks with good staying power. Loreal NutriShine in Pink Rose may not last on your lips for long but neither does it claim to do so. It's formula is super hydrating and is great for regular usage. And I normally don't talk about the packaging but just look at this lipstick, looking all classy and pretty. So if you are looking for a moisturizing lipstick which will also give your lips a bit of oomph, NutriShine will be a good choice for you. this is such a pretty color..I absolutely love it. The price is bit steep for its properties..but the colors offered in this range (all peaches and pinks) are amazing! Love the shade but boo to low staying power!! Pretty shade Karishma..too bad its not long lasting! I really like this shade, will check it out soon for myself. I'd keep it for office wear. Very well reviewed..i like the shade but sad that staying power is less.